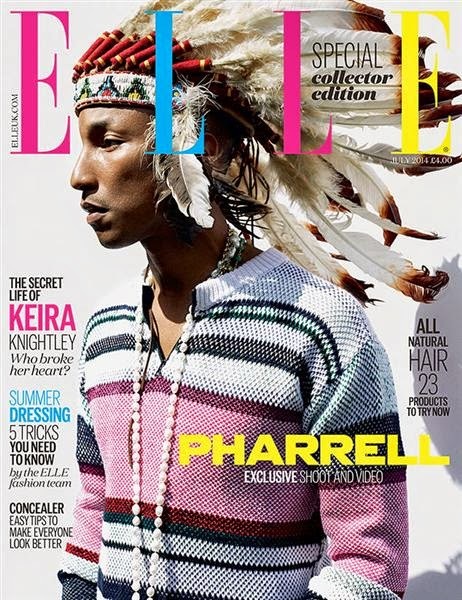 The new cover of Elle UK features Pharrell outfitted in a Native American headdress that already has critics up in arms. "We persuaded ELLE Style Award winner Pharrell to trade his Vivienne Westwood mountie hat for a native American feather headdress in his best ever shoot," read the promo copy on Elle.com (via Jezebel). Soon after the image and announcement appeared, a hashtag -- the apt #NotHappy -- also surfaced on Twitter. Angry commenters took to Facebook as well, expressing their displeasure on both Elle's and Pharrell's Facebook pages. "Even if you are part Native the headdress is off limits," wrote one user. "Its for Warriors and people of the plains culture.. You don't have the right to wear that." On Wednesday, the "Happy" singer issued a statement of apology to E! News: "I respect and honor every kind of race, background and culture. I am genuinely sorry."